Lenovo's Y700 laptop will be the first with FreeSync. Standards wars are like the game Monopoly: The one with the most property usually ends up winning. Well, AMD just snapped up the railroads and utilities. On Tuesday, the company's new Radeon Technologies Group announced it’ll have its variable refresh rate technology, dubbed FreeSync, working over HDMI ports next year. A variable refresh spec for HDMI is coming, but AMD's pushing ahead through the option of an extension to HDMI. The extension can be used in both HDMI 1.4 and HDMI 2.0 monitors. For GPU support, AMD said any GPU that supports FreeSync over DisplayPort will be able to run it over monitors that support FreeSync using HDMI. Why this matters: The key to spreading AMD’s FreeSync is to get it on as many monitors as possible. Today it’s available only on more expensive panels with DisplayPort, and Nvidia’s G-Sync has a similar limitation. By adding HDMI, AMD should see a big boost in adoption. AMD also announced its first foray into mobile FreeSync with Lenovo’s new Y700 gaming laptop. The 15.6-inch Lenovo Y700 will feature a Radeon R9 M380 GPU and a quad-core AMD FX-F8800P “Carrizo” APU for $899. The company said no fewer than eight new monitor models from Acer, LG, and Samsung will support FreeSync over HDMI. The company boasted that in monitor support it’s already outstripped Nvidia’s competing G-Sync by a healthy margin. AMD says FreeSync isn’t even a year old but already has more monitor support than Nvidia’s competing G-Sync. AMD claims 32 monitors support FreeSync vs. G-sync’s 17, adding that not all the announced G-sync monitors are available yet. AMD also dug at G-Sync by pointing out that every FreeSync panel has two inputs or more, while only a few G-Sync monitors do. That’s because G-Sync requires the use of an Nvidia-provided hardware scaler. Last month, the company announced it had solved a complaint of image judder on most FreeSync monitors, using a software low framerate compensation algorithm. Nvidia officials weren’t available to comment on AMD’s announcement. Based on recent conversations I’ve had with the company about FreeSync, however, I’d say it would shrug and say “meh.” Using our Monopoly analogy, AMD may have more pieces of property, but Nvidia owns Boardwalk and Park Place with hotels on them. One issue facing FreeSync is its dependence upon an accompanying Radeon GPU. Today Nvidia’s in the leadership position, with numbers from November giving it an astounding 81.9 percent share of add-in graphics cards today. Gamers shopping for a monitor with variable refresh rate technology today would probably buy a G-sync monitor, and that won't change if AMD continues to lose ground to Nvidia in GPU sales. 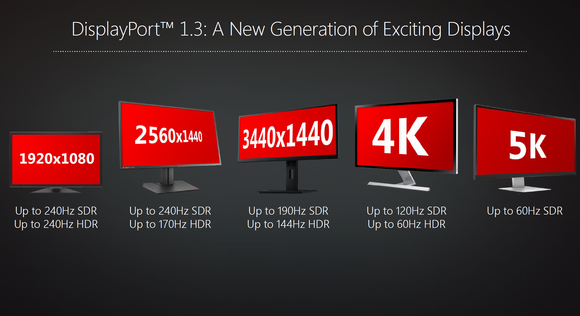 The new Radeon Technologies Group also announced it will support DisplayPort in its upcoming GPUs next year. DisplayPort 1.3 HBR3 will increase the bandwidth to 32.4GBps, which is about 80 percent more than even HDMI 2.0 and almost twice the bandwidth of DisplayPort 1.2. It may sound crazy, but it's just keeping up with display technology. A single DisplayPort 1.2 connection has just enough bandwidth to drive a UHD 4K monitor, but a single 5K panel, such as Dell’s Dell UltraSharp 27 UP2715K, requires two DisplayPort 1.2 connectors. Higher refresh rates and High Dynamic Range content will also require far more bandwidth than today’s DisplayPort can drive. DisplayPort 1.3 could run a 1080p panel at 240 frames per section and enable HDR down the road. DisplayPort 1.3 can drive a 5K panel using a single cable rather than two, and support HDR and higher refresh rates on lower-resolution monitors. AMD’s other aim-high announcement is its plan to enable high dynamic range gaming and movies eventually. Many games are actually already rendered in HDR today, the company said. But because GPUs aren’t made to output it and monitors don’t support it, it’s mapped to standard dynamic ranges. 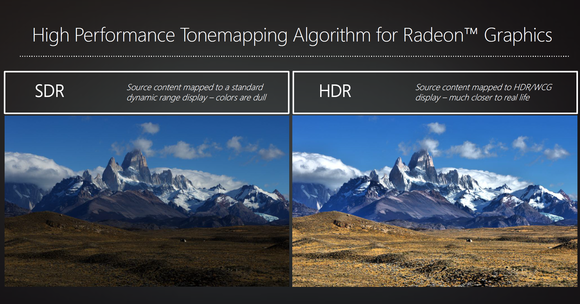 Here’s what AMD said an HDR game could look like. High dynamic range itself is the ability visualize a brightness level far outside what is “normal.” For example, you wouldn’t typically be able to see an object lit by the sun and see into the deep shadows simultaneously. With HDR, you could. The typical color chart below shows the colors used today. The black triangle is sRGB used in PCs and Blu-ray. The blue triangle is a spec called Rec. 2020 and is considered the “Holy Grail” of color space. 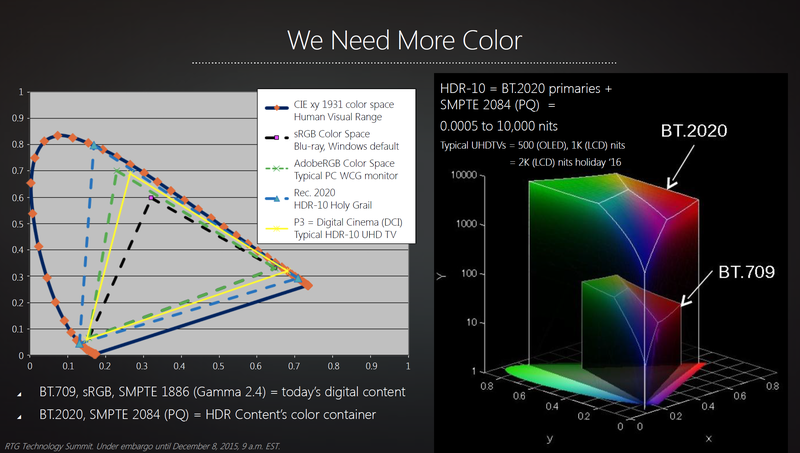 AMD said its pursuit of HDR would greatly enhance color in gaming, images and movies. The target is to enable HDR gaming and imaging using the current Radeon R9 300-series GPUs next year. Radeon GPUs introduced next year will enable HDR movie playback using HDMI 2.0 and DisplayPort 1.3, AMD says. AMD claims 1080p with HDR will look better than a 4K image with SDR. The missing component is HDR monitors, but the company said it expects HDR monitors for the masses to be available by the end of next year. There’s one monitor available today: Sony’s BVM-X300. It’s a 30-inch 4K OLED monitor that pushes $18,000. Obviously, for AMD’s HDR inititiave to gain steam, we’ll need cheaper HDR monitors, but the company is confident that will happen soon enough. 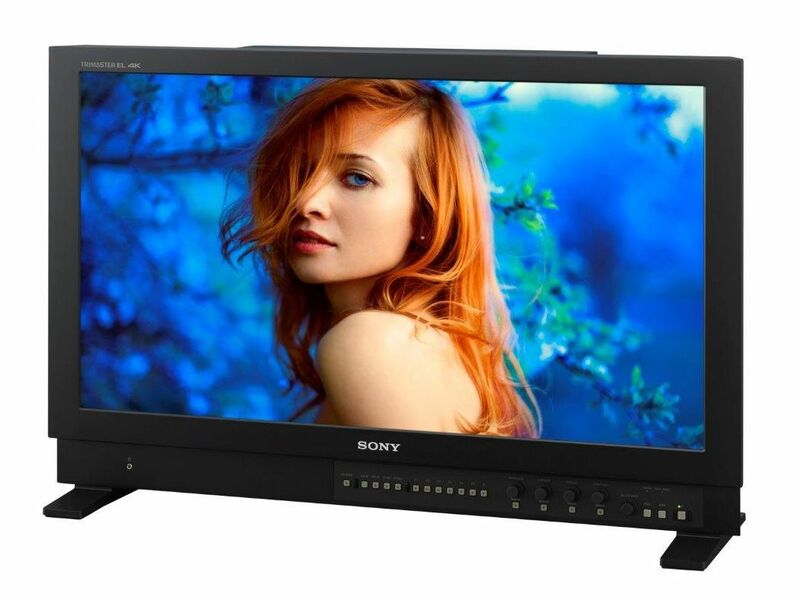 Sony's BVMX300 is an OLED 30-inch monitor that will hit 4K resolution and support HDR color for a mere $18,000. 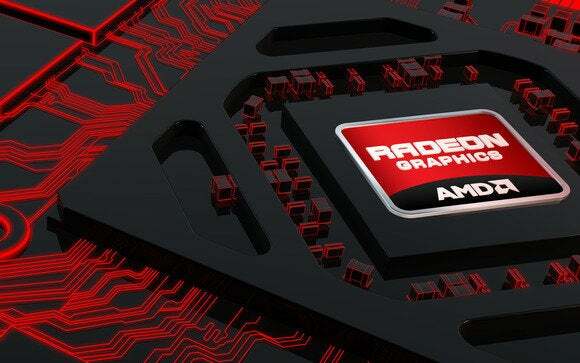 Correction: We stated the incorrect number of cores in the AMD FX-8800P. It is a quad-core CPU. PCWorld regrets the error.